Additional chromosomal abnormalities (ACAs) occurs in < 10% of patients with newly diagnosed chronic myeloid leukemia (CML) in chronic phase (CP) [1, 2]. The most common ACAs are unbalanced chromosomal abnormalities, including +Ph, +8, i(17)(q10), and +19 [1, 3]. These changes are considered “major route” ACAs, whereas other infrequent aberrations are designated as “minor route” ACAs . 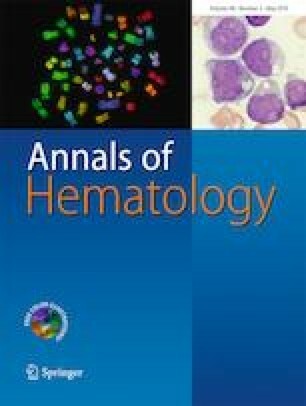 Several recurrent chromosomal rearrangements typically occurring in de novo acute myeloid leukemia (AML), such as t(8;21)(q22,q22), t(15;17)(q22;q21), and inv(16)(p13q22), have been infrequently observed as ACAs of CML (mainly the blast phase [CML-BP]) [4, 5, 6, 7, 8]. We here present a case diagnosed with CML-CP whose leukemia clone harboring both t(9;22)/BCR-ABL1 and t(5;17)/NPM1-RARA. Yan Li and Haigang Shao contributed equally to this work. This work was supported by grants from the Hunan Provincial Science and Technology Department (CN) (2010TD2022). Informed consent was obtained from the patient described.